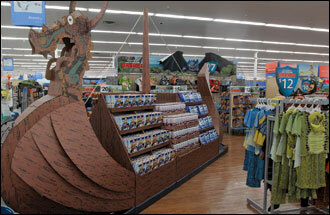 Walmart designed themed areas to display DreamWorks Animation’s ‘How to Train Your Dragon’ products. Hollywood is super-sizing its time-honored tradition of striking exclusive deals with retailers as more stores, from brick-and-motar outlets to e-tailers, line up to partner with studios for product. As much as Hollywood needs these promotional partnerships, retailers need the excitement of exclusive merchandise from blockbuster movies to drive more traffic into their stores as they slowly recover from the recession. A fevered pitch of dealmaking has swept up e-tailers (Amazon.com, Overstock.com, Groupon), traditional retailers (Target, Walmart, Toys R Us) and even brands not normally associated with tentpoles (Benjamin Moore paints) in the battle to nail down exclusive product pacts. Deals typically cover DVDs and Blu-rays with new footage, CDs with extra music tracks, vidgames with new levels and character upgrades, unique-to-the-store toy designs, apparel and other merchandise offers, special trailers and digital downloads. In some cases, it also involves the construction of a separate boutique within a company’s stores. Last week, Universal rolled out exclusive merchandise for its family film “Hop” at Walmart stores, with the retail giant agreeing to promote the pic throughout its 3,000 locations nationwide in return for being able to offer customers the chance to design their own Easter baskets with “Hop”-themed candy and other products. The deals are essentially an extension of the kinds of pacts marketers already have been making with Hollywood on summer tentpoles. Only in those cases, the brands were using the perks of a film tie-in to sell their own products: burgers, soda, cereal, cars. In the new crop of deals, the incentives are being used to sell Hollywood’s product. Retail essentially got smart and said that if the same DVD for a movie, for example, is being sold everywhere and gets discounted by one store to increase sales, others will follow, limiting the amount of profits they can earn from each disc. As a result, stores started asking studios for some exclusive DVD extras. In return, the retailers would provide the products with more favorable shelf space and back it with promotions across all forms of media. It’s hard for Hollywood to say no to that kind of exposure not only at a time when earnings from homevid and music continue to take a hit, but also when consumer products are becoming a major moneymaker for studios. “That’s part of what we have to do today,” said prexy of Warner Bros.consumer products Brad Globe last month in discussing plans around the pic. “Retail now really requires these (merchandise) events. You want to get the consumers’ attention when they walk into the store.” There are no signs that this kind of dealmaking will end anytime soon. In fact, executives at studios, particularly within consumer products divisions, stress that as long as these exclusive relationships continue to pay off for retailers, demand will only increase. At department stores with exclusive deals for star-designed clothing and accessories, business is booming. For example, JCPenney has said that 50% of its sales come from exclusive merchandise. At Macy’s the number increased from 40% to 42% between 2009 and 2008. At Kohl’s it was at 48% last year, up from 44% in ’09. Walmart and Target keep such sales figures closer to the vest, but Target has successfully moved millions of albums for music acts — adding tracks to albums from artists like Lady Gaga, Ricky Martin, Keith Urban, Taylor Swift, Enrique Iglesias, the Black Eyed Peas, Prince and Pearl Jam, and offering songs for digital download — with Taylor Swift selling more than 1 million units of “Speak Now” last year. Walmart, Target and Best Buy have been more aggressive than most in securing special versions of DVDs, Blu-rays, CDs and games. Those releases often include extras, like additional discs of footage or music, collectible character cards or toys, or include special packaging. Even Groupon agreed to push discounted ticket sales for Lionsgate’s “The Lincoln Lawyer,” in return for a trailer and interview with star Matthew McConaughey. But others have gotten more creative. Best Buy released a Minion translator cellphone app last year around “Despicable Me” as part of its promotion of the Universal and Illumination Entertainment toon. Cellphone makers and sellers are also using entertainment as a carrot to move more handsets, with Samsung having paired up with T-Mobile last year to pre-install Fox’s “Avatar” on the new Vibrant phone upon its release; this year, it’s offering “Inception” on its new Galaxy S 4G phone. Samsung made similar moves with Paramount pics, including the “Mission: Impossible” franchise. Walmart was among the first to build an in-store boutique for a film. Last year, the company designed themed areas for DreamWorks Animation’s “How to Train Your Dragon” around large Viking ships inside more than 2,500 of its stores that offered up more than 100 exclusive products. As part of the pact, Walmart spent tens of millions of dollars on media, with TV, in-theater, print and online ads promoting the film’s bow, and providing DreamWorks with some serious marketing muscle. One 30-second ad, for example, was shown on more than 13,000 screens in 4,600 theaters. “Our partnership with DreamWorks Animation has changed the way retailers can work with the movie industry,” said Gary Severson, senior VP of entertainment of Walmart U.S. at the time.